Seattle Housing Authority partners with agencies and local nonprofits that provide housing. 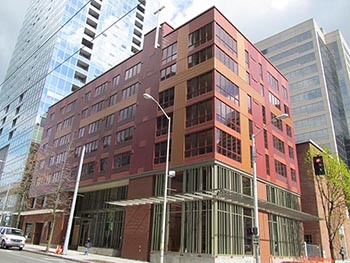 Through the Collaborative Housing program, the Seattle Housing Authority (SHA) subsidizes affordable housing that is not owned or managed by SHA. The majority is funded through what are called project-based vouchers, meaning the funding is attached to certain units of housing, typically operated by private nonprofit housing providers. These are long-term funding commitments that stay with the housing units and, unlike tenant-based vouchers, do not transfer if a tenant leaves. In addition, through different funding arrangements that do not involve a voucher, such as the Moderate Rehabilitation (Mod Rehab) program, SHA subsidizes other affordable housing it does not own or manage. Collaborative Housing units come in a range of bedroom sizes and are located in buildings throughout the city. Households must earn 50 percent or less of area median income (AMI) to qualify, and will pay 30 percent of monthly income for rent and utilities. Eligibility requirements and application procedures for Collaborative Housing are different from those of other SHA programs. Households apply directly to the nonprofit agency that operates the housing.